Inventory management software has seen unprecedented benefits by investing in mobile applications. 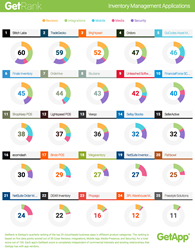 GetApp, a cloud-based business apps marketplace, has updated its inventory management rankings for Q1 2016. Stitch Labs took the number one spot, followed closely by TradeGecko in second and Brightpearl closing in in third place. GetRank– an independent app ranking of the top 25 cloud apps for inventory management– is calculated using available information on integrations, user reviews, media presence, security, and mobile app availability. Each app can achieve a total of 100 points, with 20 maximum per data point. Both the integrations and user review data points are based on information listed on GetApp, while the media score is taken from a vendor’s number of Twitter followers and Facebook fans. The mobile score is based on the availability of a mobile app on both the Android and iOS platforms, as well as their rating in both stores. Finally, security scores are based on information that vendors provide in a survey based on the Cloud Security Alliance Self-­Assessment Form. Stitch Labs’ top spot was cemented thanks to perfect scores in user reviews and integrations, while TradeGecko was just one point off for integrations. Brightpearl was also strong in integrations, chalking up full marks in this data point. Skubana showed its dedication to app security with full marks– scoring at least five points more than any other app– while Netsuite Inventory Management ranked highest in media presence with another perfect 20. “Inventory management software has seen unprecedented benefits by investing in mobile applications. From a tracking device, to a barcode reader, to a reporting tool, mobile devices can become key tools in inventory management when they have access to solutions that can help manage and consolidate the entire inventory management process. They become even more useful when they integrate with other solutions including accounting, shipping, and sales software,” says James Thornton, Chief Editor of GetApp and AppStorm. Click through to see the entire Q1 2016 GetRank of inventory management solutions.